Five years ago, Zapata created a jet-ski–powered flying platform in his workshop in the South of France. Until then, Zapata and his small team had been building parts for racing jet skis, but he’d been having trouble homologating the parts in the face of ever-stricter pollution regulations. He and his wife brainstormed a bit—should they make their own jet ski engines or somehow make a flying water-powered skateboard? Out of nowhere, Franky came up with an idea to connect a Y junction and a few elbows to a flexible hose, and to connect that to a jet ski jet in order to fly. After making a dozen prototypes, he had the first functional Flyboard—the water from the jet ski’s jet was powerful enough to lift a man, and he could fly around in the air, dragging the jet ski behind him, at up to 25 mph. 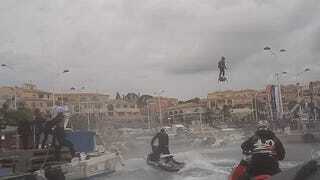 Now he’s back with the Flyboard Air. It’s a flying platform that represents four years of development and flies under its own power. The first video of it was released in early April, which—along with a lack of takeoff or landing shots—fueled speculation that the video was a hoax. It can hit 60 mph and can go as high as you like, as long as you’re willing to accept that it’s still a prototype and has no “Plan B” if there happens to be a problem. I went to a little village in Provence to watch Franky attempt to break the world record for a flying platform on his prototype. Because it is still in the prototype stage, it is not safe to fly over land; it spirals out of control if any of the four 250 horsepower engines fails, or if the gyro control system runs out of batteries. The proposed flight path was just over two kilometers, and Franky was attempting to smash the previous hoverboard record of 275 meters, set in 2015 by Catalin Alexandru Duru. But while Duru’s “hoverboard” is a battery-powered eight-rotor drone that crept along until eventually running out of batteries, Zapata’s Flyboard Air packs 1000 BHP—more power than nearly every Ferrari—from four turbojets drinking a backpack full of kerosene, can hit 60 mph, and can go as high as you like, as long as you’re willing to accept that it’s still a prototype and has no “Plan B” if there happens to be a problem. It looks particularly polished for a prototype, but there were some headaches perfecting the electronic control systems. For his record-breaking flight, Franky chose a path heading west just off the coast, from a beach near Carry-le-Rouet, France, to the port of Sausset-les-Pins. The weather was good, and there was a choice to watch the beginning of the record attempt from a boat, or to wait at the port for him to arrive. I wanted to make sure I saw the thing fly, so I chose to go on the boat and catch the start of the attempt. The initial whistle from the jets morphed into white noise, and he gently lifted off from the elevated and fenestrated takeoff platform. He rose to about ten meters, bent his knees, and started forward, accelerating until he hit 60 kph. A half-dozen jet skis and boats tore off after him—some carried spectators, others emergency crew and Zapata Racing employees. There was a witness from the Guinness Book of World Records present, too. Franky’s eerie, steady forward progress and constant altitude resembled that of the drone trailing him (for video footage) and was quite unlike the jet skis that crashed and bobbed their way through one wave after another far below. Even after he’d nearly disappeared into the distance and hooked a right toward the port, I still couldn’t get over how steady he was; there was no drama whatsoever, he was as chill as Aladdin on a magic carpet. Of course, he’s likely spent more time on flying platforms than anyone on the planet. When he got to Sausset-les-Pins, he arced gracefully through the harbor and past the sailboats before gently touching down on another platform in front of an awed crowd. He’d covered 2,252m in 3 minutes 55 seconds. Then whoosh! He pulled the trigger on the handheld controller, the jets went back to gulping enormous quantities of air, and he was off again for a victory lap around the harbor. After he’d taken off his specially-made boots, Franky walked on stage to accept the framed certificate from Guinness World Records and to thank his sponsors. What’s next? The original Flyboard spawned multiple products, including the Hoverboard and the Jetpack. Once the Zapata Racing team fully understood water propulsion, it was relatively enough to adapt it to the other formats. Their next project will be a flying jet ski/motorcycle that uses water as a propulsion system, and is even easier to control that their existing products. That’s when I realized that if you add a wingsuit, you could go 180 kph. But for the moment, he’s working hard on developing the Flyboard Air’s redundant safety systems that can handle electrical or mechanical malfunctions. Once that’s sorted out, he’ll be able to fly higher and over land, and commercialize it. They’re working on it, and Franky is positive about the future. He’s right. We do want to fly. But for the moment, the maximum flight duration is just 10 minutes. Franky has a solution for that, too, and it’s straight out of science fiction: Fly like Superman. Flying headfirst with a wingsuit would drastically cut down on power consumption, and so you could get away with carrying a heavier load of fuel during the short “vertical takeoff” period before transitioning into horizontal flight. Of course, Guinness can’t measure how much fun it will be to blast through the heavens with foot-mounted jets and a wingsuit. I doubt Franky will care.